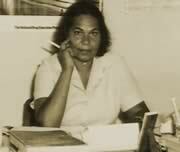 The then Northern Territory Chief Minister, Paul Everingham appointed her an adviser on Aboriginal affairs. Rosalie stood for election to the Northern Territory Legislative Assembly in 1979, in order to fight the proposed construction of a dam which threatened sacred land. Although not elected, she continued to oppose the dam, which remained a hot issue for another decade. The issue was finally resolved in 1992 when plans for the dam were abandoned.